For us, juicy sweet corn is the epitome of summer in America. It’s delicious for sure steamed or grilled and slathered with butter or Mexican crema, but there are other delicious ways to use it. In this easy class, Ann will show you some other great ways to cook with it, from salads, to soups, even to gluten free muffins. Look and learn! This cooked Corn & Tomato Salad is a summery salad that’s easily made when the BBQ is fired up. It brings together three summer favorites: corn, tomatoes, and basil. It is deeply tasty and simply excellent. Seeing stacks of corn on the cob at farm stands and greenmarkets in the summer is one of my secret pleasures. That first bite of new corn is so fresh and so sweet. This simple chowder wastes nothing of this deliciousness. The recipe makes use of the whole cob. It’s amazing just how much flavor the stripped cobs give to the stock for this soup after 10-15 minutes. Who knew crunchy, sweet gluten-free fresh corn on the cob could turn into these light, custardy dairy-free Mini Blueberry Muffins. Although sweet tasting, these decadent, rich little cakes are low in added sugar, thanks to the sweetness of the corn, making them perfect to satisfy the craving for sweets that so often strikes cancer patients going through chemotherapy. Whether you eat them for breakfast, as a snack, or even as a light dessert, served warm with a dollop of plain Greek yogurt, every which way they’re good! Take time to bake some of these virtually guilt free little treats. Enjoy! Ann shows you an easy, clean way to get corn kernels from a fresh corn cob without it shooting all over the kitchen. 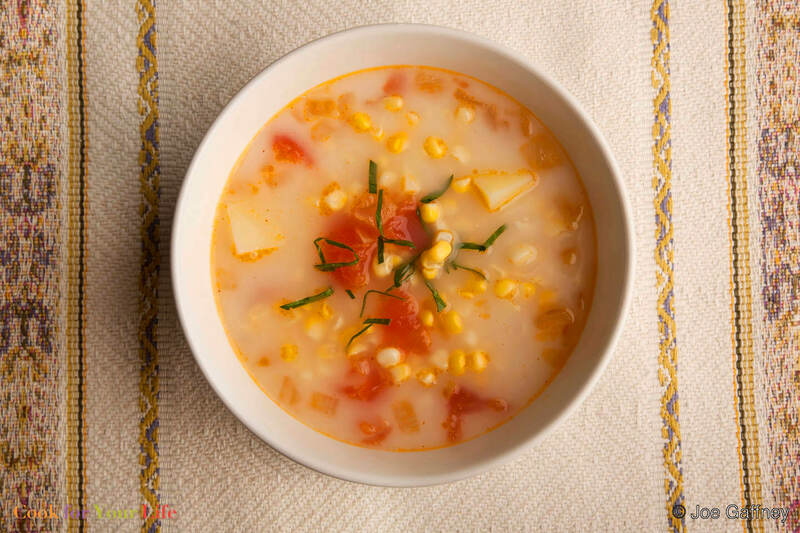 This is an easy to use fresh corn in salads, soups, cornbread, and to prep for the freezer when it’s at it sweet best.